Here’s when to follow events broadcast by NASA via https://www.nasa.gov/nasalive this week (dates and times below are given in GMT/CEST; all times subject to change). A detailed end of mission timeline is provided here. Mission updates are provided on Twitter from NASA’s @CassiniSaturn account, and shared via @esascience. On 15 September @esaoperations will also share live updates from ESA’s mission control in Darmstadt where teams will follow Cassini’s final plunge using the Agency’s deep-space ground station in Australia. 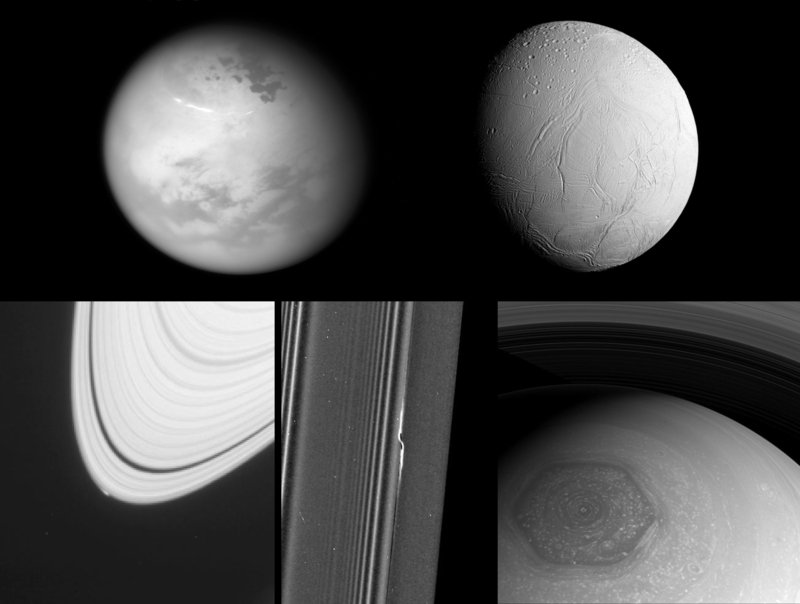 The final images will be taken on 14 September and are planned to include images of Titan, Enceladus, moonlet ‘Peggy’, a propeller feature in the rings and a colour montage of Saturn and its rings, including the aurora at the north pole (examples of previously released images of these targets are shown here). Since April, Cassini has been making weekly dives through the 2000 km gap between Saturn and its rings. This ‘Grand Finale’ maximises the scientific return of the mission, giving close dives past the inner and outer edges of the rings and the planet’s small inner moons, as well as close encounters with the upper reaches of Saturn’s atmosphere. A final distant flyby with Titan on 11 September gave the gravitational assist needed to put the spacecraft on an impact course with Saturn.